Clicking on crashes when zoomed in provides information about when a crash occurred and the role of common crash factors such as alcohol. Our interactive Vision Zero Crash Map now includes crash data through 2016, the latest year for which complete data is available, along with the time of day that crashes occurred. Provides the crash ID associated with each crash, which can assist with learning more about specific crashes. Better aggregates recent deadly crashes based on zoom level. Shows the latest High Crash Network intersections, including the rankings for pedestrian- and bicycle-specific crashes on the "People walking" and "People biking" tabs. 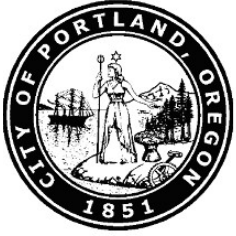 The map also includes preliminary information about traffic deaths that have occurred since 2016 based on data provided by the Portland Police Bureau. We update the map when deadly crashes occur. The northeast corner of SE Sandy/11th/Ankeny now provides better visibility for people in the crosswalk. A recent repaving project on SE Sandy Boulevard shows how our new intersection clearance guidelines help people see each other at crossings. The paving project incorporated small design tweaks to increase the visibility of people walking and biking. Among them is ensuring that at least 20 feet is clear at uncontrolled approaches to marked and unmarked crosswalks. In the photos above, you can see how we have used this 20 feet of space to add space for new bike racks (coming soon!) at the crosswalk approaching SE Ankeny Street—adding parking for 12 bikes while maintaining clear sightlines for people using the crosswalk. Win-win! SW Capitol Hwy. is one of four streets slated for major corridor safety projects in 2019. Major safety projects spanning multiple city blocks are slated for construction on four High Crash Network streets in 2019. An additional 14 HCN streets are receiving targeted fixes, including higher visibility signals, sidewalk and crosswalk infill, crossbikes, and bike lane extensions at intersections. View a map showing all 18 projects. 102nd Avenue: a pilot project will evaluate the safety impact of additional crossings, bike lanes, and safer speeds between Weidler and Sandy. Capitol Highway: extensive updates are planned between Garden Home and Taylors Ferry, while more modest (but important!) safety fixes are planned from Huber to Kerr Parkway. Marine Drive: safety fixes from 33rd to 185th include new bike lanes, rumble strips, rapid flashing beacons, and a traffic signal at 122nd. Powell Boulevard: new crosswalks, rapid flashing beacons, sidewalks, protected bike lanes, center turn lanes, lighting, and drainage are planned from 122nd to 136th. TriMet recently increased frequency on Line 73, which runs along 122nd Avenue. Big decisions about the future design of 122nd Avenue, one of Portland's most deadly streets, will be made over the next year. Please share your suggestions and concerns about 122nd Avenue at a drop-in open house on Wednesday, November 7, from 5:30 to 7:30 p.m., at Midland County Library at 805 SE 122nd Ave.
Get a ride on us this Halloween! Up to $20 savings on taxi rides with Radio Cab, Broadway Cab, Union Cab, New Rose City Cab, New Green Cab, PDX Yellow Cab, Flat Cab, Blue Taxi LLC and United Independent Cab. Coupons will be available for pickup at participating locations. A $5 savings on rides with Lyft and Uber. Riders can access the discount by entering a promo code into their apps. The promo code can be retrieved at participating locations. TriMet and Portland Streetcar are also safe and affordable travel options. Learn more about their new reduced fares for lower-income riders. 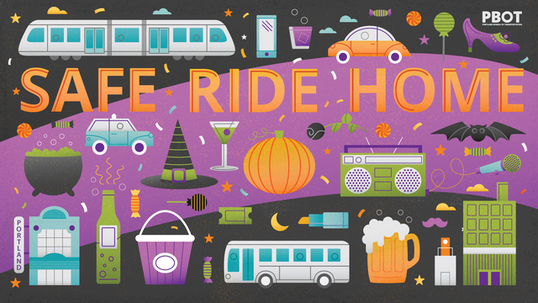 We are pleased to partner directly with SEI and Foster Area Business Association to offer Safe Ride Home at their Halloween events. A PBOT staffer crosses Sandy Blvd. at 85th Ave. on Oct. 24. We partnered with the Portland Police Bureau today, October 24, to conduct a crosswalk safety education and enforcement event on NE Sandy Blvd. at 85th Ave.
During the event, a PBOT staff member walked across NE Sandy Blvd. while police officers monitored how people driving, biking, and walking followed traffic safety laws. Officers issued warnings or citations when violations occurred. We are working with PPB to hold similar events regularly on High Crash Network streets. 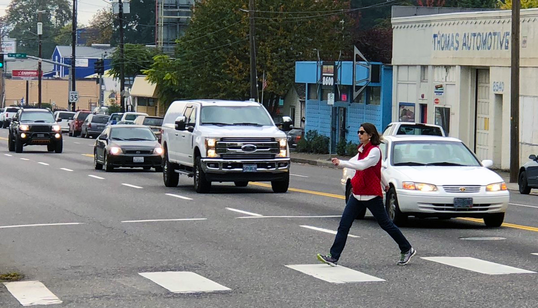 High-visibility crosswalk enforcement can significantly increase the percentage of people driving who stop for people walking at crosswalks, with positive effects shown to last for at least four years after the focused enforcement ends. People walking legally, and hit by a person driving who fails to stop for them, is the number one cause of pedestrian crashes resulting in death and serious injury in Portland. 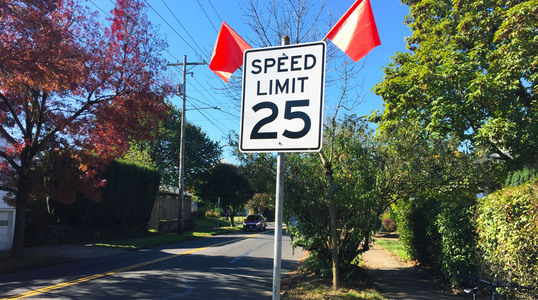 A new 25 mph sign on NE Prescott Street near 33rd Ave.
We continue to update speed limits to help manage speed—a proven contributing factor in nearly half of Portland traffic deaths. Most recently, we reduced the speed limit from 30 to 25 miles per hour on NE Prescott Street from Martin Luther King Jr. Blvd. to 42nd Ave.
An additional 13 streets have been approved for updated speed limits, including segments of NE/SE 20th, N/NE Alberta, SW Capitol, N/NE Fremont, N Greeley, N Killingsworth, and NE Sandy. Our crews will update these signs in coming weeks. We have requested updated speed limits on another 32 streets. These requests are under evaluation by the Oregon Department of Transportation, which controls speed limits on all streets statewide. The newest street safety report from the International Transport Forum, an international organization of 59 countries, says that all countries should adopt a Safe System approach that is "centered on forgiving errors and containing crash energy levels below the limits that cause catastrophic harm." A new report from the National Transportation Safety Board calls for prioritizing pedestrians in traffic safety work, including requiring "soft, pedestrian-safe bumpers" on motor vehicles. Among the recommendations in the new report is requiring all new motorcycles to be equipped with antilock brakes, a mandatory feature in new passenger vehicles since 2000.